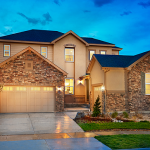 Need a floor plan that can comfortably house multiple generations? Maybe you have a college-age son living at home, or a post-college daughter with a spouse and children. Or it could be you have an elderly parent or live-in nanny, and space is tight. You’re not alone. Multi-generational housing has been on a steady, even sharp, uptick for decades. According to a PEW Research article, the population of multi-generational households rose 75% from 1980 to 2008. A similar PEW Research study showed that the percentage of 25- to 35-year-olds living in multi-generational homes had nearly doubled between 1980 and 2012, from 11% to 21.6%. Those are serious numbers, and they haven’t been lost on homebuilders. Multi-generational homes are a definite trend, with builders integrating larger, more flexible floor plans containing guest suites with all the modern amenities. All of which means there’s never been a better time to buy in the multi-gen market. Live-in suites, like the one in the Ivy plan above, can be a great fit when looking for the extra space and amenities of a multi-generational housing floor plan while retaining the look of a single-family home. Integrated seamlessly with the rest of the floor plan, live-in suites can offer the conveniences of separate garage and front door entrances, full living quarters and options on amenities like kitchens and laundry rooms. Visit our Modern Living™ page to see where we’re building the Ivy and our other multi-generational floor plans, which allow different adult age groups to live together while maintaining independent lifestyles. Need more help picking out your floor plan? Want advice on the best floor plans for large families in your area?